Each year rakhi is celebrated with an undying spirit of brotherhood. This year too, don't let miles become a boulder between you and your brother and celebrate it with equal zeal. Send rakhi to Ambarnath with an option of instant shipping and same day delivery. "Is solace anywhere more comforting than in the arms of a Sister?"? Alice walker, as always, expressed everybody's heart in the above quote too. And it couldn't have been anymore well quoted. All sisters like to hear that they are loved, so express your love by giving them gifts after they tie you Rakhi. But is the confusion of what to gift her, eating you up? FlowerAura, yet again, keeping rest to your confusion is here with their exclusive gifts for brothers to gift their lovely sisters. 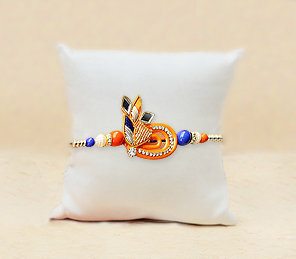 This Raksha-bandhan, we have amazing rakhi gift ideas for sister to gift as a memento to your sisters. Just browse through our website and choose the gift which is most likely to be appreciated by her and further for your convenience, we provide online rakhi gifts delivery in Ambarnath, at no additional charges. This year, your brother is not with you as he is in Ambarnath for job or education purpose and it’s almost impossible for him to bring time for you to celebrate this special occasion. You should not let the distance stand as a challenge between you and your beloved brother. No matter where you are, it’s very easy to send Rakhi to Ambarnath from the online store of FlowerAura. If you really want to make your brother feel extremely special by sending Rakhi gifts with sweets. Bored of performing those repetitive rituals every year? We can totally relate to it. Why not create a difference this year by sending rakhi gifts to Ambarnath? We have ample variety of different kind of rakhis like zardosi rakhi, Pearl rakhi to diamond rakhis and rakhi sets to choose from. FlowerAura rakhis are intertwined by the threads of immense love, care and brotherhood. And we promise that its going to be the best raksha-bandhan for both of you. What sets us apart from others is our totally reliable facility of free shipping and same day delivery. The festival should not be celebrated as a formality, but should be celebrated whole heartedly with the same verve each year. Raksha-Bandhan is primarily a North Indian festival kindling the deepest emotions of love and affection amongst the siblings. Just like all Indian festivals, this is also celebrated with a lot of enthusiasm. Celebrate this festival with your cute and little brother by tying one of the rakhis for the kids offered in this online store. With best wishes, Happy Rakhi!